The Sunday Bird Walk went to McGregor Marsh in Nanaimo. The morning was sunny but cool. The highlights included seeing two Belted Kingfishers at the first marsh at the start of the walk. We saw and heard Willow Flycatchers and a Black-headed Grosbeak singing. Cedar Waxwings were perched on snags above a marsh. A Merlin flew in above the marsh to end the walk. Turkey Vulture, Mallard, Wood Duck, Hooded Merganser, Bald Eagle, Merlin, California Quail, Band-tailed Pigeon, Anna's Hummingbird, Rufous Hummingbird, Northern Flicker, Pileated Woodpecker, Willow Flycatcher, Pacific-slope Flycatcher, Belted Kingfisher, Warbling Vireo, Violet-green Swallow, Northwestern Crow, Common Raven ,Chestnut-backed Chickadee, Bushtit, Red-breasted Nuthatch, Bewick's Wren, Brown Creeper, Golden-crowned Kinglet, Swainson's Thrush, American Robin, Cedar Waxwing, Orange-crowned Warbler, Townsend's Warbler, Wilson's Warbler, Spotted Towhee, Song Sparrow, Purple Finch, House Finch and American Goldfinch. The male American Kestrel was seen again on the hydro lines overlooking the Ugly Dwarf Meadows at Nanoose Bay. Evening Grosbeaks have been visiting feeders in the 100 block of Meridian Way in Parksville. An American Kestrel was seen on the hydro lines overlooking the Ugly Dwarf Meadows at Nanoose Bay. Six Caspian Terns and two Osprey were seen on the flats at the Nanaimo River Estuary near the Living Forest Campground in south Nanaimo. A aberrant brown Pileated Woodpecker was seen in the Departure Bay area of Nanaimo. Two Vesper Sparrows were seen along the fields at the Nanaimo Airport in south Nanaimo. The Tuesday Bird Walk went to the Shelly Road side of the Englishman River Estuary in Parksville. The morning was pleasant with periods of sunshine and was filled with bird songs. 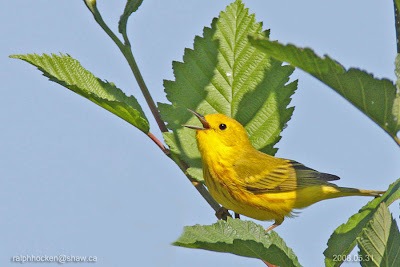 The highlights of the morning was seeing and hearing Willow Flycatchers and a Yellow Warbler singing. We saw a family of five Belted Kingfishers perched on a snag just above the River giving us close views as the young were being fed. Sixteen birders saw and heard the following thirty-two species of birds. European Starling, Cedar Waxwing, Orange-crowned Warbler, Yellow Warbler, Spotted Towhee, Song Sparrow, White-crowned Sparrow, Brewer's Blackbird, Purple Finch and House Finch. An Evening Grosbeak was spotted near Dawkins Lane in Nanaimo. A Great Horned Owl was seen perched by the north side trail about 150 meters east of the deep bay, at the western side of Neck Point Park in Nanaimo. A Ring-necked Pheasant was seen in the Chase River area near Beck Creek in south Nanaimo. 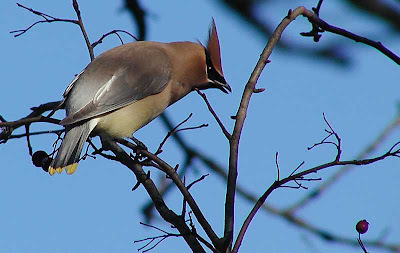 Over ten Cedar Waxwings were seen near the Beaver Ponds at Morrell Wildlife Sanctuary in Nanaimo. Black-headed Grosbeaks are visiting feeders along Extension Road in south Nanaimo. A male and female California Quail with fourteen puffball chicks were seen in a yard in Fairwinds in Nanoose Bay. An adult female Lark Bunting was seen in the parking lot at Botanical Beach near Port Renfrew. An Eastern Kingbird was spotted perching and flycatching on Mittlenatch Island. The Tuesday Bird Walk on June 30, 2009 will be going to the Plummer Road side of the Englishman River Estuary in Parksville. Playground at 9:00 A.M. or at the corner of Plummer Road and Shorewood Drive at about 9:20 a.m. The Sunday Bird Walk on July 05 will be going to the Beaver Ponds in Nanoose Bay. Meet at the Bird store at 9:00 a.m. or at the parking area about 100 yards past the fourway stop along Powerpoint Road at about 9:20 a.m.
Eastern Kingbird: Heidi Krajewsky Photo. 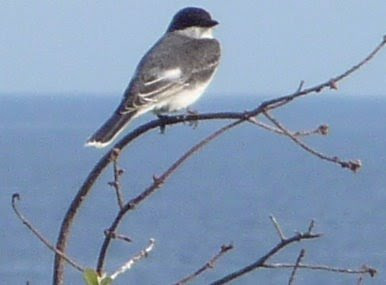 An Eastern Kingbird was seen perched and flycatching on Mittlenatch Island. 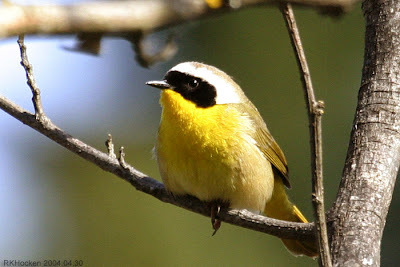 This bird is usually found east of the Coastal Mountains. along with the date, name and location of your sighting. The Sunday Bird Walk went to Linley Valley in Nanaimo. 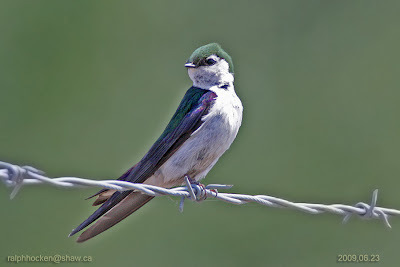 Northern Rough-winged Swallow flew low over Cottle Lake hawking insects. Twenty-two birders saw and heard the following forty-two species of birds. Crossbills, American Goldfinch and Pine Siskin. A Merlin was spotted chasing a Bald Eagle above Corfield Avenue in Parksville. Englishman River. A family of Chipping Sparrows entertained us near the trail. A Pileated Woodpecker was clinging to a tree, giving us a great view. Eighteen birders saw and heard the following twenty-nine species of birds. Englishman River Estuary in Parksville. highway 19a) Road at about 9:20 a.m. The Sunday Bird Walk on June 28 will be going to McGregor Marsh in Nanaimo. the Quilted Duck at about 9:20 a.m. The Tuesday Bird Walk went to the Top Bridge Trail in Parksville. The morning was pleasant with periods of sunshine and was filled with bird songs. The highlights of the morning was seeing Willow Flycatchers perching and hearing them singing. 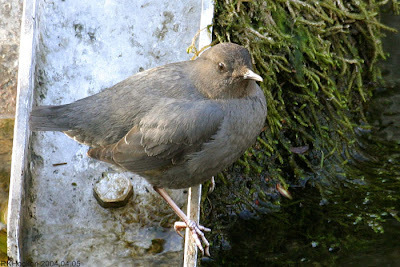 We spotted an American Dipper feeding near a big rock in the Englishman River. A family of Chipping Sparrows entertained us near the trail. A Pileated Woodpecker was clinging to a tree, giving us a great view. Pacific-slope Flycatchers, Warbling Vireos, Winter Wrens and Swainson's Thrush sang throught the morning. Caspian Tern: Ralph Hocken Photo. A Barred Owl was spotted at the Englishman River Estuary in Parksville. The Sunday Bird Walk went to Springwood Park in Parksville. The morning was sunny and warm. The highlights of the morning included a Chipping Sparrow feeding a fledgling and several California Quail chicks moving through the underbrush at their parent's command. We saw three sets of Brown Creeper families moving up the trees. We saw Warbling Vireos high up in the trees and although we didn't see him, a Red-eyed Vireo sang non-stop. Seventeen birders saw and heard the following forty-one species of birds. Canada Geese, Turkey Vulture, Bald Eagle, Merlin, California Quail, Killdeer, Ring-necked Pheasant, Band-tailed Pigeon, Rufous Hummingbird , Northern Flicker, Willow Flycatcher, Pacific-slope Flycatcher, Cassin's Vireo, Warbling Vireo, Red-eyed Vireo, Northwestern Crow, Common Raven, Chestnut-backed Chickadee, Bushtit, Red-breasted Nuthatch, Brown Creeper, Bewick's Wren, Winter Wren, Golden-crowned Kinglet, Swainson's Thrush, American Robin, Orange-crowned Warbler, Townsend's Warbler, Black-throated Grey Warbler, Yellow Warbler, Yellow-rumped Warbler, Common Yellow-throat, Spotted Towhee, Song Sparrow, Black-headed Grosbeak, White-crowned Sparrow, Chipping Sparrow, Purple Finch, American Goldfinch and Pine Siskins. A Red Crossbill was seen at backyard feeders in the 5100 block of Laguna Way in Nanaimo. A Western Tanager and Evening Grosbeaks were seen along Hewstone Road in Cedar. Four American White Pelicans and fourteen Caspian Terns were seen along the tideline at the Cowichan Estuary in Cowichan Bay. A pair of Blue-winged Teal were seen on the pond near the forestry museum in Duncan. 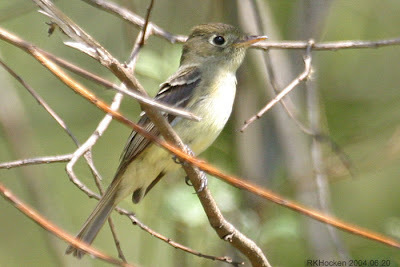 An Olive-sided Flycatcher was seen and heard singing for about three hours in a garden at the Little Qualicum River Village. to the trail, scurrying about. Twenty birders saw and heard the following thirty species of birds. The Tuesday Bird Walk on June 16, 2009 will be going to Top Bridge Trail in Parksville. Playground at 9:00 A.M. or at the parking area along Industrial Way near Tuan Road at about 9:20 a.m. 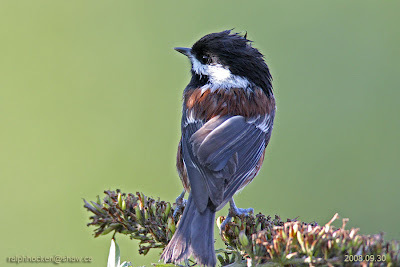 The Sunday Bird Walk on June 14 will be going to Linley Valley in Nanaimo..
Meet at the Bird store at 9:00 a.m. or at the end of Burma Road at about 9:20 a.m. The Tuesday Bird Walk went to Springwood Park in Parksville. The morning was sunny and calm and was filled with bird songs. The highlight of the day was hearing a Red-eyed Vireo singing non stop from high up in the forest canopy for about twenty minutes. Warbling Vireos, Orange-crowned Warblers and a Townsend's Warbler serenaded us as well for most of the morning. We watched as two Brown Creepers took nesting material into a nest under the bark of a big leaf maple tree. We saw Red-breasted Nuthatches gleaning insects high up in a tree. There was a fledgling Pileated Woodpecker clinging to the bark of a tree, not daring to move and a family of Bewick's Wrens low in the bushes, next to the trail, scurring about. A pair of Ring-necked Turtle Doves were seen at feeders in a backyard in the 1600 block of Casper's Way in Nanaimo. The Sunday Bird Walk went to Morden Colliery Historic Park in south Nanaimo. The morning was sunny and warm. Sixteen birders saw and heard the following thirty-two species of birds. Canada Geese, Common Merganser, Great Blue Heron, Spotted Sandpiper, Turkey Vulture, Bald Eagle, Northern Flicker, Pileated Woodpecker, Anna's Hummingbird, Pacific-slope Flycatcher, Warbling Vireo, Cassin's Vireo, Northwestern Crow, Common Raven, Violet-green Swallow, Golden-crowned Kinglet, Chestnut-backed Chickadee, Brown Creeper, Red-breasted Nuthatch, Winter Wren, Swainson's Thrush, American Robin, Orange-crowned Warbler, Townsend's Warbler, Black-throated Gray Warbler, Wilson's Warbler, Common Yellow-throat, Western Tanager, Black-headed Grosbeak, Spotted Towhee, Chipping Sparrow, Song Sparrow, Purple Finch and House Finch. A Green Heron was seen at Buttertubs Marsh in Nanaimo. A pair of Evening Grosbeaks were seen visiting feeders in the 400 block of Dawkins Lane in Nanaimo. A Red-eyed Vireo was seen and heard just over the Railway Tracks at Springwood Park in Parksville. A Golden Eagle was seen at Witchcroft Lake off Benson View Road in Nanaimo. The Tuesday Bird Walk went to Lot Ten along the Little Qualicum River in Qualicum Beach. The morning was sunny and calm. A Warbling Vireo was singing as we started the walk and we continued to hear them sing for most of the morning. We saw Orange-crowned Warblers and a Black-throated Gray Warbler high up in the trees. A Townsend's Warbler and a Hammond's Flycatcher were singing. We saw two Spotted Sandpipers several times during the morning flying just above the water on the Little Qualicum River. We watched as two Brown Creepers took insects into a nest under the bark of a snag. A Red-breasted Sapsucker was gleaning insects just above us giving us great close-up looks. We watched a Pacific-slope Flycatcher hawking insects as it flew from it's perch several times. Eighteen birders saw and heard the following thirty species of birds. American Robin, European Starling, Orange-crowned Warbler, Black-throated Gray Warbler, Townsend's Warbler, Spotted Towhee, Chipping Sparrow, Song Sparrow, Black-headed Grosbeak and Brown-headed Cowbird. 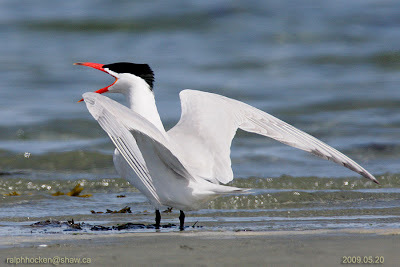 Caspian's Terns were spotted at the Cowichan River Estuary in Cowichan Bay. A pair of Black-headed Grosbeaks were seen along Harlequin Crescent in Nanoose Bay. The Tuesday Bird Walk on June 09, 2009 will be going to Springwood Park in Parksville. Playground at 9:00 A.M. or at the west end of Despard Avenue at about 9:20 a.m. The Sunday Bird Walk on June 14 will be going to Springwood Park in Parksville. Eihteen birders saw and heard the following thirty species of birds.